Molly Griep not done yet! Madison Throws Club's Molly Griep (Sr) Whitewater, decided that throwing 149-11 on Tuesday was to tantalizingly close to 150... so she followed her performance up with a new P.R. of 152-1 in the Discus Friday. She also set a new season best in the Shot at 41-7.5. Her new Discus P.R. moves her from 13th to #10 on the ALL-TIME list. Congrats Molly and Coach Luebke. Madison Throws Club's THERON BAUMANN, (Sr) Monona Grove, has been a big part of the state throwing landscape since he made a name for himself as a sophomore. Well no one will be forgetting the name Theron Baumann any time soon, because he has cemented his name in the ALL-TIME WISCONSIN record books with a monster Discus throw of 195-8, placing him #4 on the list. His series: F, 189-9, 192-6, 184-0, F, 195-8. OUTSTANDING WORK THERON!!! Congrats to you and Coach Storms. Molly Griep pushes Discus P.R. Molly Griep (sr) Whitewater High School, has had big throws before...but Tuesday was a little different...this was a really big throw. Molly set a new personal record and school record in the discus with a throw of 149'11". Her throw moves her on to the ALL-TIME WISCONSIN HONOR ROLE with the #13 throw in state prep history. Griep a North Dakota recruit, has qualified for the WIAA State Meet every year in High School. Great job Molly! Kailee Kamps pushes SHOT P.R. Kailee Kamps, (sr) Belmont, has been a model of consistency in the the Shot Put ring this season. Kailee had thrown over 43' feet in several meets already this season and that consistency set the stage to hit a big throw when everything was just right. It must have been pretty close to just right on Monday, Kailee threw a big P.R. going 45'2" at a relay meet in Boscobel. Kailee, a Minnesota recruit, is now #22 on the All-Time Wisconsin Honor Roll, where she already holds the #15 spot in the Discus at 147'5". Congrats Kailee on your big throw, keep up the good work. Watertown Invite with a throw of 131-6. Corinne Franz, Coach Frontier, and Dana Thompson. Corinne and Dana are now tied on the All-Time Discus List. Dana is now coaching the throws at Sugar River. Some great performances were posted by MTC throwers from all over the state. Including several P.R.s. 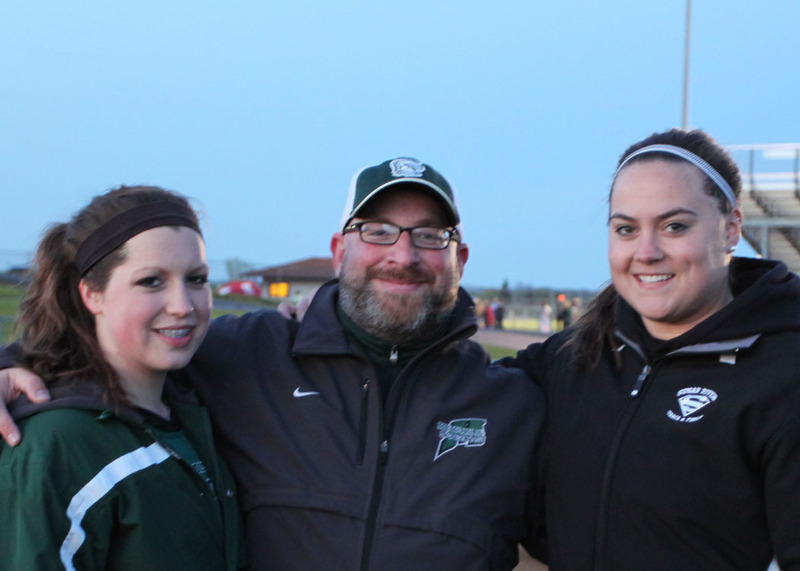 Jessi Ford (Jr.) Madison Memorial broke the 100' barrier in the discus for the first time. Craig Thompson (Jr.) Sugar River broke into the 40's and 100's for the first time. April McCarthy (Sr.) Stoughton threw 114'10" to add her name to the honor roll list in the discus. Jason Zahn (Sr.) Grafton had his first outdoor meet of the year and moved straight to number 1 on the Boys Discus honor roll list at 183'6". Theron Baumann improved in the Discus with a throw of 176' and went over the 60' barrier outdoors for the first time. Riley Budde and A.J. Natter also added their names to the Discus H.R. Madison Throws Club Summer Registration is now available. Summer CLUB sessions are on Mondays and Wednesdays 3:30-5pm, beginning June 11th. Become a member and participate in 8 Shot Put and Discus Sessions for $180. If you have questions about any Club or Special Session. Contact me. Can't commute to all the Club Sessions and want to set up a 1-on-1 or small group session. Contact me. Need help planning a weight room or conditioning program for the throws. Contact me. Congratulations to all of the Madison Throws Club throwers who have gotten off to white hot starts to the 2012 season. Many MTCers have marks that put them at or near the top of the State Honor Roll lists for both boys and girls - shot and discus. Remember its early and hard work is needed to maintain and improve upon these numbers. Thanks to Dave Figi for compiling the Girls Honor Roll since 1994: check it out here.. Check out the boys honor roll here. 39' 08.75 Paige Day 11 DC Everest 2/5 USATF Indoor @ Carthage Col. In the first outdoor meet of the 2012 season, Corinne Franz (jr, Madison Memorial) wasted no time taking her discus P.R. to a new level. 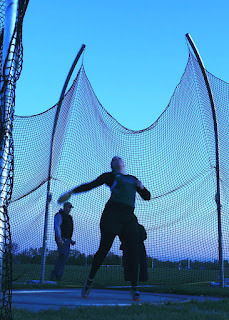 Her throw of 143'8" shattered the former Madison Memorial High School record of 131'7" held by Lori Wasserburger since 1975. Corinne's prevoius P.R. was 124'11" set at last year's WIAA State Meet leading to her 4th place finish in DI. 143'8" puts her in the top 50 All-Time in the State of Wisconsin tying her at #23 with former MTC athlete Dana Thompson. Corinne made the 'Splash of the Week' and was honored by wissports.net - picks 1 high school athlete each week from the state of Wisconsin. Congratulations Corinne! Keep up the hard work. 2012 MTC Summer Registration is now available. Opportunities to throw will be abundant and diverse.